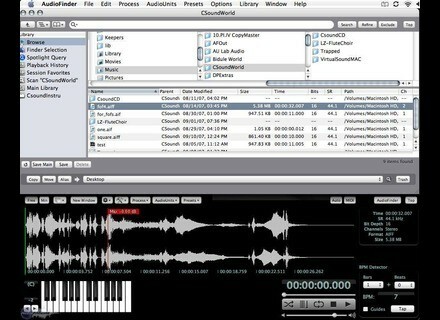 AudioFinder, Digital Audio Editor from Iced Audio. Iced Audio has updated AudioFinder to v5.0.5. Added support for uploading directly to SoundCloud from AudioFinder's browser. Added support for accepting drag and drops from iTunes. New threaded file AudioViewer waveform analyzer. Allows for instant abort and skip. Smoother more responsive playback start when switching long tracks. Added preference to set the Playlist playback pause time. Added Show Playback Cursor location option to the Locations popup in the Sample Tool. When browsing the file system the list view now shows all folders at the top instead of interleaved. Bug fix when attempting to write Metadata to a missing file, AudioFinder will now present a warning dialog when a file has been renamed, moved or deleted outside of AudioFinder. Code prep for 64 bit optimizations. Redesigned the Metadata Viewer to be more compact and able to be minimized much smaller. Added "Set Spotlight Comment" to the Metadata Viewer. Clicking this button writes the current Metadata formatted text to the file's Spotlight entry. Viewable with Finder's Get Info. Added "Get Info" button to the Metadata Viewer to open Finder's "Get Info" window. Added new Tagging defaults that cover a wide range of sonic descriptors. Added "Copy Metadata to Spotlight Comments" to the File menu. Added "Copy" and "Paste" menu items to the Metadata Viewer "Template" menu. Added "Metadata Tags Setup..." to the Library menu. Use this to build your set of preset Tags. Improved the Combo Box tagging drop downs to be more user friendly and to provide Tool Tips to display the complete tag when the field is not wide enough. Changed the way the Tags combo boxes work, they now append Tags selected from the drop down instead of replacing what's already there. Added support for renaming a selected folder. Automatically updates the Metadata Database. Streamlined the File menu by moving some items into a "Convert" submenu. Moved the "Mount" button to the File menu as it's more of a power user feature. Switched HUD Windows to using the new AppKit provided HUD windows. Command-H besides hiding the windows will now also minimize any AudioUnit Inspectors. Bug fix for the "Remove" item in the Metadata Viewer "Template" menu. Bug fix when Processing mono files with AudioUnits resulting in extra padding at the end. Creation Date and Modification Dates are now being actively tracked by the Metadata Database. Missing items in the Metadata Database Manager are now sorted. Renamed the "Show Info" button to "Show Metadata" to clear up confusion. Fixed a slow start up issue when there were thousands of Tags in the Metadata Database. Bug fix for crash on start up with bad Audio Units. Couple of bug fixes for the Folder Template feature. Fixed an Audio Unit sorting problem that results in Wave Z-Noise note showing in the menu. Command-D now properly toggles showing/hiding the Metadata Info Viewer. Fixed play on Dock icon drag and drop for Leopard. Overall work on the Tagging user interface has made it much easier to use. Muse Research Receptor 2 System Software Updated Muse Research has released version 1.8.20100924 of the System Software for the Receptor 2 Hardware Plug-in Player. 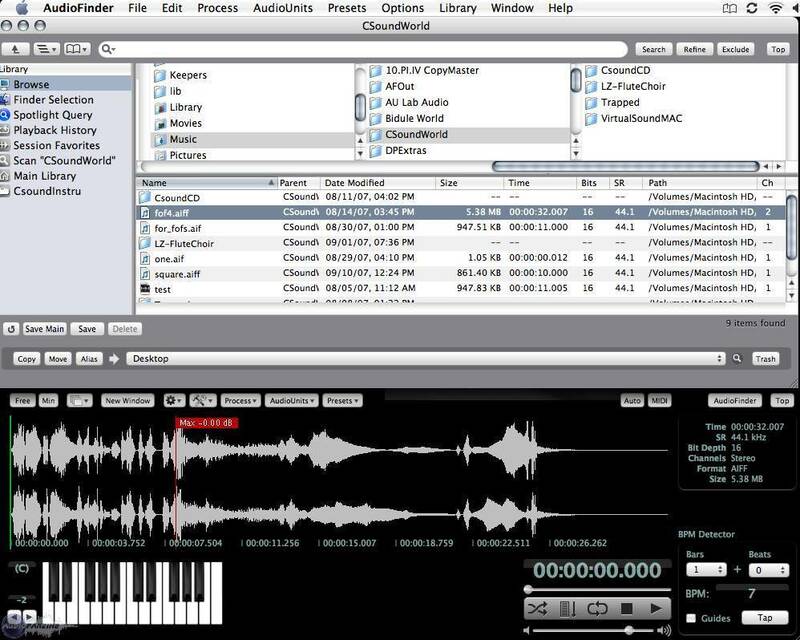 ifoundasound LiveProfessor 1.3 ifoundasound recently updated LiveProfessor to version Beta 1.3. Freak Show Enterprises Updates JambaLaya Freak Show Enterprises has updated JambaLaya to v1.3.4.